I have been wanting to try one of the whole steamed fish preparations at Peninsula Restaurant and finally got the opportunity to do so. They offer 5 different steamed fish types to choose from including Red Snapper, Chilean Sea Bass (not whole), Flounder or Walleye. Those of you who want to try this but don’t want to deal with a whole fish should choose the Sea Bass. (Though a whole steamed sea bass would be spectacular, I am not sure there is a steaming device or appetite large enough for this). We tried the house special “Peninsula Steamed Fish” with Red Snapper. This was a very mild dish lightly steamed in soy sauce. The fish was delicious. But be warned it is presented table side with the head and tail. On my next visit I would like to try one with a bit more heat. 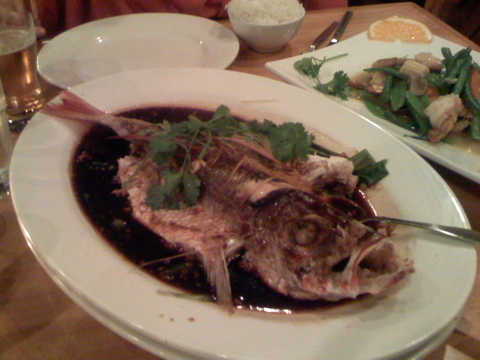 If you like it hot I would go for one of the whole fish with curry or tamarind sauce. Here is a direct link to their online menu.